The Oasis pool from River Pools powered by Thursday Pools is a 15′ wide medium sized freeform shaped fiberglass pool available in lengths of 27′ or 30′. The oversized first step doubles as a small tanning ledge and can also be equipped with bubbler water features. The deep end has a bench seat that can comfortably seat 3 -4 people. The Oasis pool also provides a diagonal open swim lane. 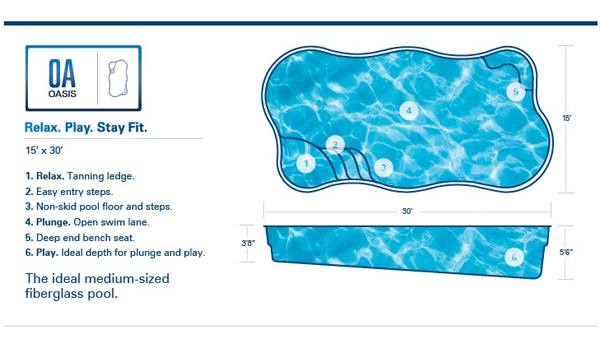 If you’re looking for a small to medium sized freeform shaped pool the Oasis pool could be a great choice. The Oasis pool is built in Illinois by Signature Pools. If you’re looking for a freeform shaped pool with similar features but want a larger pool we’d recommend checking out the Wellspring pool.